ST Racing Concepts – Green Aluminum for Traxxas Slash and Monster Jam Stampede! « Big Squid RC – RC Car and Truck News, Reviews, Videos, and More! ST Racing Concepts – Green Aluminum for Traxxas Slash and Monster Jam Stampede! ST Racing just sent us a photo that had us drooling. 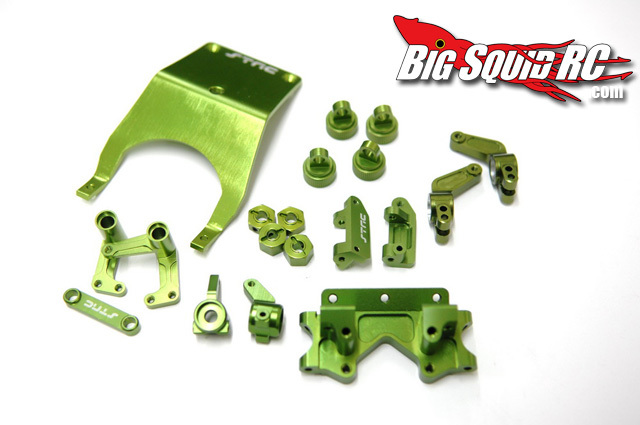 Their new Green Anodized Aluminum parts for the Traxxas Slash 2WD and Monster Jam Stampede Trucks looks beautiful. I have always been a fan of the green, and for those of you running Monster Jam stuff, you know you want these! There are steering knuckles, front casters blocks, rear hub carriers, steering bellcranks, a front bulk head, front and rear skid plates, hex adapters and shock caps. And if you run a Traxxas, you NEED shock caps! Check out the ST Racing Concepts website for more info.